no. of days reported since January to March, 23, 2017 x your daily rate divide by 12 , then it is your 13th mo. prorated . I started working Last Januray 24 2017 and my basic pay was 18000, i got my appraisal for 23000 on August 30 2017, how does this affect my 13th month pay? 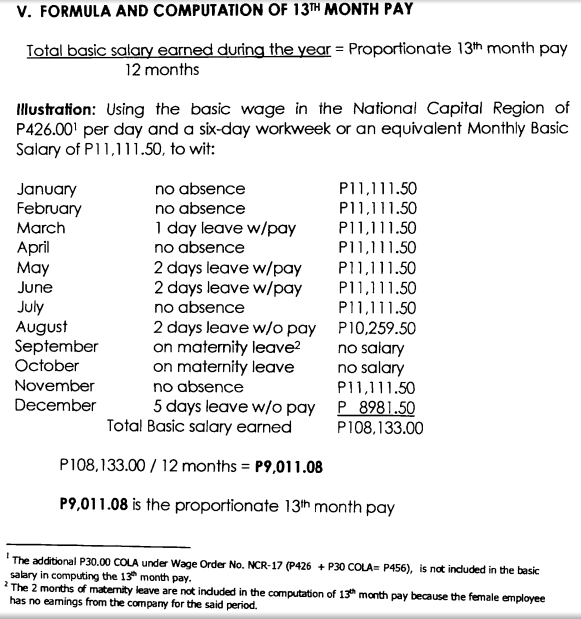 13th month pay is equal to the Total basic salary EARNED during the year divided by 12. The absences and tardiness are ALREADY deducted from the employee's salary for the said month, thus, it will NOT be deducted AGAIN from the computed amount of 13th month pay. Hi i started in my company just this oct 23 at 17,000.00 how would i compute my 13th month? I started last June 16, 2017, my salary is Php26,000.00 monthly (gross), how much should be my 13th month pay? Hi. if my rate increased in last 4 months of this year, and i am working more than a year. which rate should i use to compute my 13th month? Is it possible the highest rate applies to the whole year? Thanks! The premise of this offering is done per click which just implies that each time the web crawler gives them a guest, the organization will pay for it. Hello, I just want to inquire. I was hired as "Regular Employee" July 2018, will I get 100% of my 13th month being hired as regular or is it still pro-rated??? I resigned from my company and Last working day is on the 30th of November. Will I get my 13th month pay on December 2018? yung holiday po ba kasama sa count ng number of days mo the whole year? for example sa 26days ko sa isang buwan may 2 days na holiday, ibabawas ko ba sa 26 days yung holiday? I was resigned last oct. 2017 . and I was almost 5 months and half working.. Am I qualified to have a 13th month pay? hello,, greetings to all... can an employer deduct salary loan or cash advances from 13th month pay? I was hired as "Regular Employee" september 2012 until now,my monthly basic rate is 12,000 now and my company gave my 13th month is 10,700 is it ok ? Please advise..